Not to be confused with Golden Law, Golden ratio, or Golden Act. For other uses, see Golden Rule (disambiguation). "Do Unto Others" redirects here. For the 1915 silent film, see Do Unto Others (film). The idea dates at least to the early Confucian times (551–479 BC) according to Rushworth Kidder, who identifies that this concept appears prominently in Buddhism, Christianity, Hinduism, Judaism, Taoism, Zoroastrianism, and "the rest of the world's major religions". The concept of the Rule is codified in the Code of Hammurabi stele and tablets, 1754-1790 BC. 143 leaders encompassing the world's major faiths endorsed the Golden Rule as part of the 1993 "Declaration Toward a Global Ethic", including the Baha'i Faith, Brahmanism, Brahma Kumaris, Buddhism, Christianity, Hinduism, Indigenous, Interfaith, Islam, Jainism, Judaism, Native American, Neo-Pagan, Sikhism, Taoism, Theosophist, Unitarian Universalist and Zoroastrian. According to Greg M. Epstein, " 'do unto others' ... is a concept that essentially no religion misses entirely", but belief in God is not necessary to endorse it. Simon Blackburn also states that the Golden Rule can be "found in some form in almost every ethical tradition". Yet, as with any historically prominent maxim, the Golden Rule is not without its controversy (as seen in the Criticism section below). The term "Golden Rule", or "Golden law", began to be used widely in the early 17th century in Britain by Anglican theologians and preachers; the earliest known usage is that of Anglicans Charles Gibbon and Thomas Jackson in 1604. Possibly the earliest affirmation of the maxim of reciprocity, reflecting the ancient Egyptian goddess Ma'at, appears in the story of The Eloquent Peasant, which dates to the Middle Kingdom (c. 2040–1650 BC): "Now this is the command: Do to the doer to make him do." This proverb embodies the do ut des principle. A Late Period (c. 664–323 BC) papyrus contains an early negative affirmation of the Golden Rule: "That which you hate to be done to you, do not do to another." According to Simon Blackburn, the Golden Rule "can be found in some form in almost every ethical tradition". Why was only a single specimen of man created first? 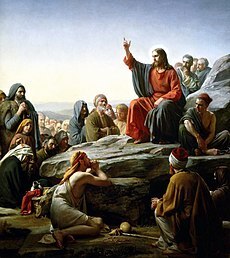 To teach us that he who destroys a single soul destroys a whole world and that he who saves a single soul saves a whole world; furthermore, so no race or class may claim a nobler ancestry, saying, 'Our father was born first'; and, finally, to give testimony to the greatness of the Lord, who caused the wonderful diversity of mankind to emanate from one type. And why was Adam created last of all beings? To teach him humility; for if he be overbearing, let him remember that the little fly preceded him in the order of creation. Commentators summed up foreigners (= Samaritans), proselytes (= 'strangers who resides with you') (Rabbi Akiva, bQuid 75b) or Jews (Rabbi Gamaliel, yKet 3, 1; 27a) to the scope of the meaning. On the verse, "Love your fellow as yourself", the classic commentator Rashi quotes from Torat Kohanim, an early Midrashic text regarding the famous dictum of Rabbi Akiva: "Love your fellow as yourself – Rabbi Akiva says this is a great principle of the Torah." Israel's postal service quoted from the previous Leviticus verse when it commemorated the Universal Declaration of Human Rights on a 1958 postage stamp. Jesus taught the Golden Rule during the Sermon on the Mount. The "Golden Rule" was given by Jesus of Nazareth (Matthew 7:12, see also Luke 6:31). The common English phrasing is "Do unto others as you would have them do unto you". A similar form of the phrase appeared in a Catholic catechism around 1567 (certainly in the reprint of 1583). The Golden Rule is stated positively numerous times in the Old Testament: Leviticus 19:18 ("Thou shalt not avenge, nor bear any grudge against the children of thy people, but thou shalt love thy neighbour as thyself: I am the LORD. "; see also Great Commandment) and Leviticus 19:34 ("But treat them just as you treat your own citizens. Love foreigners as you love yourselves, because you were foreigners one time in Egypt. I am the Lord your God."). Do to no one what you yourself dislike. Recognize that your neighbor feels as you do, and keep in mind your own dislikes. Jesus' teaching goes beyond the negative formulation of not doing what one would not like done to themselves, to the positive formulation of actively doing good to another that, if the situations were reversed, one would desire that the other would do for them. This formulation, as indicated in the parable of the Good Samaritan, emphasizes the needs for positive action that brings benefit to another, not simply restraining oneself from negative activities that hurt another. A Bedouin came to the prophet, grabbed the stirrup of his camel and said: O the messenger of God! Teach me something to go to heaven with it. Prophet said: "As you would have people do to you, do to them; and what you dislike to be done to you, don't do to them. Now let the stirrup go!" [This maxim is enough for you; go and act in accordance with it!]" O' my child, make yourself the measure (for dealings) between you and others. Thus, you should desire for others what you desire for yourself and hate for others what you hate for yourself. Do not oppress as you do not like to be oppressed. Do good to others as you would like good to be done to you. Regard bad for yourself whatever you regard bad for others. Accept that (treatment) from others which you would like others to accept from you... Do not say to others what you do not like to be said to you. Buddha (Siddhartha Gautama, c. 623–543 BC) made this principle one of the cornerstones of his ethics in the 6th century BC. It occurs in many places and in many forms throughout the Tripitaka. In support of this Truth, I ask you a question – "Is sorrow or pain desirable to you ?" If you say "yes it is", it would be a lie. If you say, "No, It is not" you will be expressing the truth. Just as sorrow or pain is not desirable to you, so it is to all which breathe, exist, live or have any essence of life. To you and all, it is undesirable, and painful, and repugnant. Killing a living being is killing one's own self; showing compassion to a living being is showing compassion to oneself. He who desires his own good, should avoid causing any harm to a living being. Precious like jewels are the minds of all. To hurt them is not at all good. If thou desirest thy Beloved, then hurt thou not anyone's heart. If people regarded other people’s states in the same way that they regard their own, who then would incite their own state to attack that of another? For one would do for others as one would do for oneself. If people regarded other people’s cities in the same way that they regard their own, who then would incite their own city to attack that of another? For one would do for others as one would do for oneself. If people regarded other people’s families in the same way that they regard their own, who then would incite their own family to attack that of another? For one would do for others as one would do for oneself. And so if states and cities do not attack one another and families do not wreak havoc upon and steal from one another, would this be a harm to the world or a benefit? Of course one must say it is a benefit to the world. Here ye these words and heed them well, the words of Dea, thy Mother Goddess, "I command thee thus, O children of the Earth, that that which ye deem harmful unto thyself, the very same shall ye be forbidden from doing unto another, for violence and hatred give rise to the same. My command is thus, that ye shall return all violence and hatred with peacefulness and love, for my Law is love unto all things. Only through love shall ye have peace; yea and verily, only peace and love will cure the world, and subdue all evil." The "Declaration Toward a Global Ethic" from the Parliament of the World’s Religions (1993) proclaimed the Golden Rule ("We must treat others as we wish others to treat us") as the common principle for many religions. The Initial Declaration was signed by 143 leaders from all of the world's major faiths, including Baha'i Faith, Brahmanism, Brahma Kumaris, Buddhism, Christianity, Hinduism, Indigenous, Interfaith, Islam, Jainism, Judaism, Native American, Neo-Pagan, Sikhism, Taoism, Theosophist, Unitarian Universalist and Zoroastrian. In the folklore of several cultures the Golden Rule is depicted by the allegory of the long spoons. Trying to live according to the Golden Rule means trying to empathise with other people, including those who may be very different from us. Empathy is at the root of kindness, compassion, understanding and respect – qualities that we all appreciate being shown, whoever we are, whatever we think and wherever we come from. And although it isn’t possible to know what it really feels like to be a different person or live in different circumstances and have different life experiences, it isn’t difficult for most of us to imagine what would cause us suffering and to try to avoid causing suffering to others. For this reason many people find the Golden Rule’s corollary – "do not treat people in a way you would not wish to be treated yourself" – more pragmatic. Do not do to others what you would not want them to do to you. [is] (…) the single greatest, simplest, and most important moral axiom humanity has ever invented, one which reappears in the writings of almost every culture and religion throughout history, the one we know as the Golden Rule. Moral directives do not need to be complex or obscure to be worthwhile, and in fact, it is precisely this rule's simplicity which makes it great. It is easy to come up with, easy to understand, and easy to apply, and these three things are the hallmarks of a strong and healthy moral system. The idea behind it is readily graspable: before performing an action which might harm another person, try to imagine yourself in their position, and consider whether you would want to be the recipient of that action. If you would not want to be in such a position, the other person probably would not either, and so you should not do it. It is the basic and fundamental human trait of empathy, the ability to vicariously experience how another is feeling, that makes this possible, and it is the principle of empathy by which we should live our lives. —  Adam Lee, Ebon Musings, "A decalogue for the modern world"
When we say that man chooses for himself, we do mean that every one of us must choose himself; but by that we also mean that in choosing for himself he chooses for all men. For in effect, of all the actions a man may take in order to create himself as he wills to be, there is not one which is not creative, at the same time, of an image of man such as he believes he ought to be. To choose between this or that is at the same time to affirm the value of that which is chosen; for we are unable ever to choose the worse. What we choose is always the better; and nothing can be better for us unless it is better for all. According to Marc H. Bornstein, and William E. Paden, the Golden Rule is arguably the most essential basis for the modern concept of human rights, in which each individual has a right to just treatment, and a reciprocal responsibility to ensure justice for others. However Leo Damrosch argued that the notion that the Golden Rule pertains to "rights" per se is a contemporary interpretation and has nothing to do with its origin. The development of human "rights" is a modern political ideal that began as a philosophical concept promulgated through the philosophy of Jean Jacques Rousseau in 18th century France, among others. His writings influenced Thomas Jefferson, who then incorporated Rousseau's reference to "inalienable rights" into the United States Declaration of Independence in 1776. Damrosch argued that to confuse the Golden Rule with human rights is to apply contemporary thinking to ancient concepts. There has been research published arguing that some 'sense' of fair play and the Golden Rule may be stated and rooted in terms of neuroscientific and neuroethical principles. The Golden Rule can also be explained from the perspectives of psychology, philosophy, sociology, human evolution, and economics. Psychologically, it involves a person empathizing with others. Philosophically, it involves a person perceiving their neighbor also as "I" or "self". Sociologically, "love your neighbor as yourself" is applicable between individuals, between groups, and also between individuals and groups. In evolution, "reciprocal altruism" is seen as a distinctive advance in the capacity of human groups to survive and reproduce, as their exceptional brains demanded exceptionally long childhoods and ongoing provision and protection even beyond that of the immediate family. In economics, Richard Swift, referring to ideas from David Graeber, suggests that "without some kind of reciprocity society would no longer be able to exist." George Bernard Shaw wrote, "Do not do unto others as you would that they should do unto you. Their tastes may be different." This suggests that if your values are not shared with others, the way you want to be treated will not be the way they want to be treated. Hence, the Golden Rule of "do unto others" is "dangerous in the wrong hands", according to philosopher Iain King, because "some fanatics have no aversion to death: the Golden Rule might inspire them to kill others in suicide missions." Immanuel Kant famously criticized the golden rule for not being sensitive to differences of situation, noting that a prisoner duly convicted of a crime could appeal to the golden rule while asking the judge to release him, pointing out that the judge would not want anyone else to send him to prison, so he should not do so to others. Kant's Categorical Imperative, introduced in Groundwork of the Metaphysic of Morals, is often confused with the Golden Rule. Mr Bernard Shaw's remark "Do not do unto others as you would that they should do unto you. Their tastes may be different" is no doubt a smart saying. But it seems to overlook the fact that "doing as you would be done by" includes taking into account your neighbour's tastes as you would that he should take yours into account. Thus the "golden rule" might still express the essence of a universal morality even if no two men in the world had any needs or tastes in common. Marcus George Singer observed that there are two importantly different ways of looking at the golden rule: as requiring (1) that you perform specific actions that you want others to do to you or (2) that you guide your behavior in the same general ways that you want others to. Counter-examples to the golden rule typically are more forceful against the first than the second. In his book on the golden rule, Jeffrey Wattles makes the similar observation that such objections typically arise while applying the golden rule in certain general ways (namely, ignoring differences in taste, in situation, and so forth). But if we apply the golden rule to our own method of using it, asking in effect if we would want other people to apply the golden rule in such ways, the answer would typically be no, since it is quite predictable that others' ignoring of such factors will lead to behavior which we object to. It follows that we should not do so ourselves—according to the golden rule. In this way, the golden rule may be self-correcting. An article by Jouni Reinikainen develops this suggestion in greater detail. It is possible, then, that the golden rule can itself guide us in identifying which differences of situation are morally relevant. We would often want other people to ignore any prejudice against our race or nationality when deciding how to act towards us, but would also want them to not ignore our differing preferences in food, desire for aggressiveness, and so on. This principle of "doing unto others, wherever possible, as they would be done by..." has sometimes been termed the platinum rule. Charles Kingsley's The Water Babies (1863) includes a character named Mrs Do-As-You-Would-Be-Done-By (and another, Mrs Be-Done-By-As-You-Did). ^ a b c d Antony Flew, ed. (1979). "golden rule". A Dictionary of Philosophy. London: Pan Books in association with The MacMillan Press. p. 134. ISBN 978-0-330-48730-6. This dictionary of philosophy contains the following quote under the entry for "golden rule": "The maxim 'Treat others how you wish to be treated'. Various expressions of the rule exist in the tenets of most religions and creeds through the ages, testifying to its universal applicability." (end quote). ^ Walter Terence Stace argued that the Golden Rule was much more than simply an ethical code. Instead, he posits, it "express[es] the essence of a universal morality." The rationale for this crucial distinction occupies much of his book The Concept of Morals (1937). See: Stace, Walter T. (1937). "ch. 6". The Concept of Morals. New York: The MacMillan Company (reprinted 1975 by permission of Macmillan Publishing Co. Inc.); (also reprinted by Peter Smith Publisher Inc, January 1990). p. 136. ISBN 978-0-8446-2990-2. ^ W.A. Spooner, "The Golden Rule," in James Hastings, ed. Encyclopedia of Religion and Ethics, Vol. 6 (New York: Charles Scribner's Sons, 1914) pp. 310–12, quoted in Rushworth M. Kidder, How Good People Make Tough Choices: Resolving the Dilemmas of Ethical Living, Harper, New York, 2003. ISBN 0-688-17590-2. p. 159. Simon Blackburn also notes the connection between Confucious and the Golden Rule. Simon, Blackburn (2001). Ethics: A Very Short Introduction. Oxford: Oxford University Press. p. 101. ISBN 978-0-19-280442-6. ^ a b c Towards a Global Ethic (An Initial Declaration) ReligiousTolerance.org. – Under the subtitle, "We Declare," see third paragraph. The first line reads, "We must treat others as we wish others to treat us." ^ "Parliament of the World's Religions – Towards a Global Ethic" (PDF). Archived from the original (PDF) on 11 April 2013. Retrieved 12 September 2013. ^ Esptein, Greg M. (2010). Good Without God: What a Billion Nonreligious People Do Believe. New York: HarperCollins. p. 115. ISBN 978-0-06-167011-4. ^ Simon, Blackburn (2001). Ethics: A Very Short Introduction. Oxford: Oxford University Press. p. 101. ISBN 978-0-19-280442-6. ^ Thomas Jackson: First Sermon upon Matthew 7,12 (1615; Werke Band 3, S. 612); Benjamin Camfield: The Comprehensive Rule of Righteousness (1671); George Boraston: The Royal Law, or the Golden Rule of Justice and Charity (1683); John Goodman: The Golden Rule, or, the Royal Law of Equity explained (1688; Titelseite als Faksimile at Google Books); dazu Olivier du Roy: The Golden Rule as the Law of Nature. In: Jacob Neusner, Bruce Chilton (Hrsg. ): The Golden Rule – The Ethics of Reprocity in World Religions. London/New York 2008, S. 94. ^ Gensler, Harry J. (2013). Ethics and the Golden Rule. Routledge. p. 84. ISBN 978-0-415-80686-2. ^ Eloquent Peasant PDF Archived 25 September 2015 at the Wayback Machine "Now this is the command: do to the doer to make him do"
^ "The Culture of Ancient Egypt", John Albert Wilson, p. 121, University of Chicago Press, 1956, ISBN 0-226-90152-1 "Now this is the command: Do to the doer to cause that he do"
^ Eloquent Peasant PDF Archived 25 September 2015 at the Wayback Machine "The peasant quotes a proverb that embodies the do ut des principle"
^ "A Late Period Hieratic Wisdom Text: P. Brooklyn 47.218.135", Richard Jasnow, p. 95, University of Chicago Press, 1992, ISBN 978-0-918986-85-6. ^ Isocrates, Nicocles or the Cyprians, Isoc 3.61 (original text in Greek); cf. Isoc. 1.14, Isoc. 2.24, 38, Isoc. 4.81. ^ Thomas Firminger Thiselton-Dyer (2008). Pahlavi Texts of Zoroastrianism, Part 2 of 5: The Dadistan-i Dinik and the Epistles of Manuskihar. Forgotten Books. ISBN 978-1-60620-199-2. ^ Lucius Annaeus Seneca (1968). The Stoic Philosophy of Seneca: Essays and Letters of Seneca. Norton. ISBN 978-0-393-00459-5. ^ Blackburn, Simon (2001). Ethics: A Very Short Introduction. Oxford: Oxford University Press. p. 101. ISBN 978-0-19-280442-6. ^ Jewish Encyclopedia: Hillel: "His activity of forty years is perhaps historical; and since it began, according to a trustworthy tradition (Shab. 15a), one hundred years before the destruction of Jerusalem, it must have covered the period 30 BC–10 AD"
^ a b c "ADAM". JewishEncyclopedia.com. Retrieved 12 September 2013. ^ "Mishnah Seder Nezikin Sanhedrin 4.5". sefaria.org. Retrieved 17 July 2016. ^ "Tosefta on Mishnah Seder Nezikin Sanhedrin 8.4–9 (Erfurt Manuscript)". toseftaonline.org. 21 August 2012. ^ "Leviticus". The Torah. Jewish Publication Society. p. 19:17. ^ Plaut, The Torah – A Modern Commentary; Union of American Hebrew Congregations, New York 1981; p. 892. ^ Kedoshim 19:18, Toras Kohanim, ibid. See also Talmud Yerushalmi, Nedarim 9:4; Bereishis Rabbah 24:7. ^ "Sol Singer Collection of Philatelic Judaica". Emory University. Archived from the original on 7 April 2008. ^ Vaux, Laurence (1583). A Catechisme / or / Christian Doctrine. Manchester, England: The Chetham Society, reprinted by The Chetham Society in 1885. p. 48 (located in the text just before the title, "Of the Five Commandments of the Church." Scroll up slightly to see a section saying: "The sum of the ten Commandments does consist in the love towards god, and our neighbor (Ephe. 4., Matt. 7.). In the first Table be three Commandments: which take away and forbid sin and vice against the worshipping of God. They forbid idolatry, apostasy, heresy, superstition, perjury, blasphemy, and move us to the pure and true worshipping of God in heart, word and deed. In the Second table be seven Commandments, which command us to give reverence and honor to every man in his degree, to profit all, and hurt none: to do unto others, as we would be done to ourselves."). ^ "John Wesley's Explanatory Notes on Luke 10". Christnotes.org. Retrieved 12 September 2013. ^ Moore: Judaism in the First Centuries of the Christian Era; Cambridge, Harvard University Press, 1927–1930; Vol. 2, p. 87, Vol. 3, p. 180. ^ Th. Emil Homerin (2008). Neusner, Jacob (ed.). The Golden Rule: The Ethics of Reciprocity in World Religions. Bloomsbury Publishing. p. 99. ISBN 978-1-4411-9012-3. ^ a b Th. Emil Homerin (2008). Neusner, Jacob (ed.). The Golden Rule: The Ethics of Reciprocity in World Religions. Bloomsbury Publishing. p. 102. ISBN 978-1-4411-9012-3. Donaldson Dwight M. 1963. Studies in Muslim Ethics, p. 82. London: S.P.C.K. ^ "Bahá'í Reference Library – The Hidden Words of Bahá'u'lláh, p. 11". Reference.bahai.org. 31 December 2010. Retrieved 12 September 2013. ^ "The Golden Rule Bahá'í Faith". Replay.waybackmachine.org. 11 April 2009. Archived from the original on 11 April 2009. Retrieved 12 September 2013. ^ "The Hidden Words of Bahá'u'lláh – Part II". Info.bahai.org. Retrieved 12 September 2013. ^ "Mahabharata Book 13". Mahabharataonline.com. 13 November 2006. Retrieved 12 September 2013. ^ ""Gautama Buddha (B.C. 623-543)" by T.W. Rhys-Davids, The World's Great Events, B.C. 4004–A.D. 70 (1908) by Esther Singleton, pp. 124–135". Unz.org. 28 November 2012. Retrieved 12 September 2013. ^ "The Buddha (BC 623–BC 543) – Religion and spirituality Article – Buddha, Bc, 623". Booksie. 8 July 2012. Retrieved 12 September 2013. ^ Varni, Jinendra (1993). Sagarmal Jain (ed.). Samaṇ Suttaṁ. translated by T. K. Tukol and K. K. Dixit. New Delhi: Bhagwan Mahavir memorial Samiti. ^ Chinese Text Project. Confucianism, The Analects, Section 15: Wei Ling Gong, (see number 24). Chinese Text Project. Retrieved 29 December 2011. ^ Hubbard, L. Ron (2012). "Precept 19". The Way to Happiness. The Way to Happiness Foundation International. Retrieved 22 April 2012. ^ Hubbard, L. Ron (2007). The Way to Happiness: A Common Sense Guide to Better Living. Los Angeles: L. Ron Hubbard Library. p. 59. ISBN 978-1-59970-036-6. ^ Hubbard, L. Ron (2012). "Precept 20". The Way to Happiness. The Way to Happiness Foundation International. Retrieved 22 April 2012. ^ Hubbard, L. Ron (2007). The Way to Happiness: A Common Sense Guide to Better Living. Los Angeles: L. Ron Hubbard Library. p. 61. ISBN 978-1-59970-036-6. ^ "Parliament of the World's Religions". Parliamentofreligions.org. 16 August 2013. Retrieved 12 September 2013. ^ "The Council for a Parliament of the World's Religions". Parliamentofreligions.org. 16 August 2013. Retrieved 12 September 2013. ^ Esptein, Greg M. (2010). Good Without God: What a Billion Nonreligious People Do Believe. New York: HarperCollins. p. 115. ISBN 978-0-06-167011-4. Italics in original. ^ a b "Thinkhumanism.com". Thinkhumanism.com. Retrieved 12 September 2013. ^ "UBC.ca". 15 March 2008. Archived from the original on 14 September 2002. Retrieved 12 September 2013. ^ "Think Humanism". Think Humanism. Retrieved 12 September 2013. ^ "A decalogue for the modern world". Ebonmusings.org. 1 January 1970. Retrieved 12 September 2013. ^ Sartre, Jean-Paul (2007). Existentialism Is a Humanism. Yale University Press. pp. 291–292. ISBN 978-0-300-11546-8. ^ Defined another way, it "refers to the balance in an interactive system such that each party has both rights and duties, and the subordinate norm of complementarity states that one's rights are the other's obligation." Bornstein, Marc H. (2002). Handbook of Parenting. Lawrence Erlbaum Associates. p. 5. ISBN 978-0-8058-3782-7. See also: Paden, William E. (2003). Interpreting the Sacred: Ways of Viewing Religion. Beacon Press. pp. 131–132. ISBN 978-0-8070-7705-4. ^ Damrosch, Leo (2008). Jean Jacques Russeau: Restless Genius. Houghton Mifflin Company. ISBN 978-0-618-44696-4. ^ Wattles, Jeffrey (1996). The Golden Rule. Oxford University Press. ^ Vogel, Gretchen. "The Evolution of the Golden Rule". Science. 303 (Feb 2004). ^ Swift, Richard (July 2015). "Pathways & possibilites". New Internationalist. 484 (July/August 2015). ^ "Only a Game: The Golden Rule". Onlyagame.typepad.com. 24 May 2007. Retrieved 12 September 2013. ^ Shaw, George Bernard (1903). Man and Superman. Archibald Constable & Co. p. 227. Retrieved 23 February 2018. ^ Source: p. 76 of How to Make Good Decisions and Be Right All the Time, Iain King, 2008, Continuum, ISBN 978-1-84706-347-2. ^ Stace, Walter T. (1937). The Concept of Morals. New York: The MacMillan Company; (reprinted 1975 by permission of Macmillan Publishing Co. Inc.); (also reprinted by Peter Smith Publisher Inc, January 1990). p. 136. ISBN 978-0-8446-2990-2. ^ Jouni Reinikainen, "The Golden Rule and the Requirement of Universalizability." Journal of Value Inquiry. 39(2): 155–168, 2005. ^ Karl Popper, The Open Society and Its Enemies, Vol. 2 (1966 ), p. 386. Dubbed "the platinum rule" in business books such as Charles J. Jacobus, Thomas E. Gillett, Georgia Real Estate: An Introduction to the Profession, Cengage Learning, 2007, p. 409 and Jeremy Comfort, Peter Franklin, The Mindful International Manager: How to Work Effectively Across Cultures, Kogan Page, p. 65. ^ "Mary Wakefield: What 'The Water Babies' can teach us about personal". The Independent. 22 October 2011.